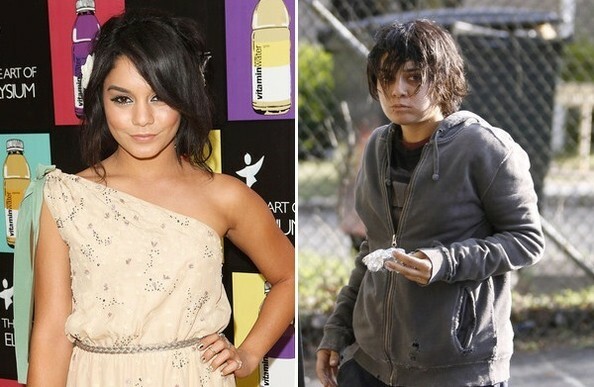 We're used to seeing the gorgeous Vanessa Hudgens all dolled up on the red carpet and in her movies, but she looked far from red carpet-ready while filming her new movie Gimme Shelter this week. In fact, the actress wasn't even recognizable! Vanessa Hudgens in 'Gimme Shelter' (Pacific Coast News) The pictures from the shoot show the Disney star with short, unkempt hair and tattered clothing for her role as a homeless person in the upcoming flick. The scary makeunder is quite shocking! Shooting the new flick has been taking up a lot of the actress' time, but she says she's very proud of the role. She wrote on her Facebook page this week: “Hey guys, what’s happenin? I have been so stupidly busy working on Gimme Shelter. I’m so excited and proud of the work I’ve been doing and let me tell you, you all are going to be SHOCKED with how I look in this movie. It’s crazy sauce. Lol.